The installation comprised two frames - one open, to view the scene beyond and one, a convex mirror to view the scene behind. This mirror device is known as a Claude Glass (named after the 17th century painter - Claude Lorrain) and helped artists in search of the ‘picturesque’ to compose a picture without being distracted by looking at the actual landscape. The installation attempts to encapsulate the need for observation and the desire for retreat and reflection. 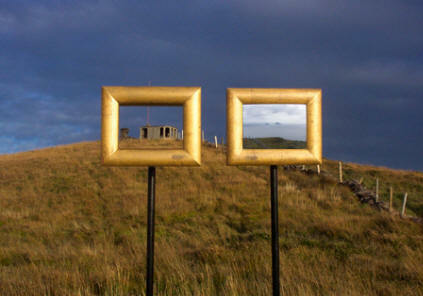 In 2006, I had a residency at Cill Rialaig artist retreat on the west coast of Ireland in County Kerry. Nearby was Bolus Head that plunged down into the Atlantic ocean - next stop Newfoundland! The headland has been a defensive site for centuries from which to warn of attack or invasion. A derelict World War 2 lookout post and the remains of a 18th century barracks are testimony to the value of this location. Nine miles out into the ocean is the 700 feet high Skellig Michael rock on which the monks established a monastery in the 7th century.